I really love to share learnings, insights and tips in my weekly newsletter to help ambitious women like you get clarity and grow in confidence so that you can make decisions and take action. 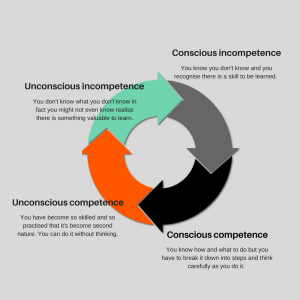 A couple of weeks ago, I shared about the conscious competence cycle in my newsletter. It really resonated with my readers who shared some amazing valuable skills. How do I get so much done? People often ask me … “how do you get so much done? To me it is just what I do and I don’t understand how I couldn’t not get so much done. I compare it to learning to drive a car. When you first learn to drive, you consciously go through each step. If you’re driving a manual car, when you need to change gear, first you take your foot off the accelerator, you put your foot down on the clutch, bring it to the biting point, change gear, put your foot back on the accelerator…. (you’re at the conscious incompetence stage of learning – in other words you know you don’t know what you’re doing). Actually there’s a stage before that – unconscious incompetence – which is when you don’t even know there’s anything to learn. However there comes a stage when you know what to do and in which order but you still have to think about it – conscious competence. When you have learned to drive, you no longer think about how to change gear. You just do it. It’s become part of your unconscious competence. If somebody asks you to explain it, you have to stop and really think (unless you’re a driving instructor). For me, taking action is within my unconscious competence. Therefore deconstructing HOW I do it can take a little thought. That will be true for you too. There will be skills and talents that you have that you take for granted because they are your unconscious competence. You just do it. It doesn’t occur to you that others can’t do it. You can’t explain it. How do you know when it’s one of your unconscious competence skills? If somebody asks “How do you do that?” and you respond “You just do it” or “It’s common sense” or “It’s easy“. Or maybe internally you roll your eyes and think “Oh for goodness sake, it’s obvious“. I invite you to discover your most valuable skills – your unconscious competence skills. Notice what you notice. Notice any time you think to yourself “well that’s easy” or “that’s just common sense” or “surely it’s obvious”. Often these skills are the ones that you take for granted (and therefore you might not recognise their value) but actually they are your most valuable skills. For those who prefer pictures to words. What is your unconscious competence? Take time this week to notice and acknowledge your hidden talents and skills. Your most valuable skills. They might be hidden to you but in full view for everybody else. Do share what you come up with. I’d love to know. p.s. if you liked this, you’ll love my weekly newsletter which gives you more tips & tricks on career, confidence and leadership for ambitious women who want to balance work and life more confidently. You just need to sign up <here>> to get those straight into your Inbox.